Cake Pop Stands by KC Bakes are so multi-functional, what else will you use your stand for? Want some fast and easy cookies tonight? Want cookies that will impress friends and co-workers? 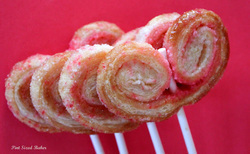 If the answer is YES to all these questions, then you should make these PALMIERS! Palmiers [pahlm-YAY-s] are a crispy delicacy made from puff pastry dough that is sprinkled with granulated sugar, folded and rolled several times, then cut into thin strips. After baking, these golden brown, caramelized pastries are served with coffee or tea or as a dessert accompaniment. Caramel Apples are a tasty and festive Fall treat, but they are a bit clunky and really, does anyone ever eat the entire apple? Burwell General Store solves the problem, and adds a little extra pizzazz with their spiked recipe! 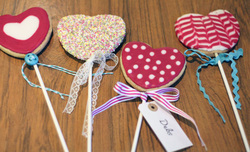 These are sophisticated enough for any adult party, or you could leave out the Amaretto and make these for a kids party! Who doesn't love pie? 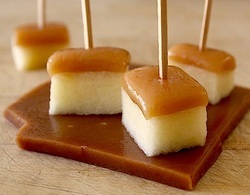 Somehow its even yummier when its bite-size & on a stick! 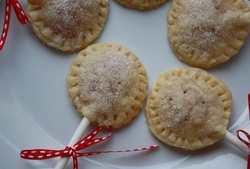 This is a great photo tutorial, showing you how to make your own pie pops step-by-step. A Couple More Hours gives you great presentation tips as well! 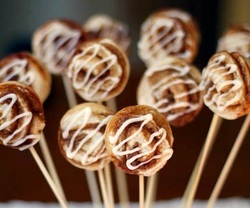 These mini-cinnamon buns on a stick are sure to surprise anyone who sees them. Wow your co-workers at your next breakfast meeting or bake them for the perfect weekend morning side dish. Chef authors Jeff & Zoë show you how to make these yummy treats in a step-by-step photo tutorial that is sure to make your mouth water! Are you a cookie rookie? Fear not! This recipe & photo tutorial will be your secret to success! No baking required here! 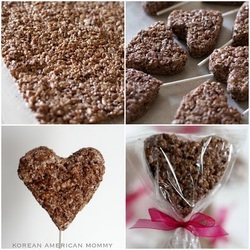 Lisa shows you how to turn simple Rice Krispy treats into a lovely party favor in her beautifully photographed recipe tutorial. 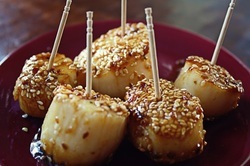 Impress the guests at your next dinner party with these pops! They are so simple, you won't believe it! Check out the Recipe or Video Instructions. Note: Lorraine is in the UK and mentions metric measurements in the video; check out her written recipe for U.S. measurements. Are you going to a get-together or hosting a party of your own? 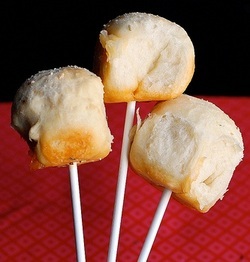 Your guests will absolutely love these pizza pops! Get creative and fill them with a variety of pizza toppings like mushrooms, pepperoni, green peppers, or onions. If you're feeling daring, try Hawaiian-style by adding pinepple and ham. Heat up marinara sauce and serve in ramekins for dipping! Do you need a new idea for appetizers? Learn how to make these tasty treats using only 5 ingredients with Kristy's recipe tutorial. 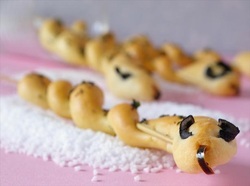 Dinner guests of any age are sure to love these Snake-shaped breadsticks! Black olive eyes, & a pimento tongue, how creative!